The pipeline survey industry has undergone a technological revolution in the past couple of years, and the consequential benefits and challenges are only just beginning to be fully realized. The cost efficiency of subsea operations has been one of the key focus areas of the offshore energy industry in recent years. This focus, combined with increased growth in the amount of subsea infrastructure now in-situ on the seafloor, has seen a rising need for innovative approaches to subsea asset inspection. These solutions need to be cost-efficient, maintain data quality, and be able to provide a platform that supports future technologies. Fast remotely operated vehicles (ROVs) and the use of spatially referenced high-resolution video and still imagery are at the heart of the transition from old methods (towed sidescan/traditional ROV GVI) to future requirements. While cost efficiency has been the key driver, reduced vessel days also limit health, safety and environment (HSE) exposure and carbon footprint, both of which are high focus areas for the operators. Fast ROV surveys is a solution that meets the demands for cost-saving and at the same time provides a platform for current and future digital technologies. Fast ROVs have significantly improved survey acquisition speed, which in turn has reduced offshore acquisition time by nearly half. There have also been technological advances, such as UHD still cameras and lasers, which have revolutionized the data that can be collected for pipeline surveys. These technologies have in turn given us access to new data, such as level of detail (LoD) mesh, orthorectified mosaics and high-density 3D point cloud models, for example. This has supported the development of FDI surveys which are starting to revolutionize how pipeline integrity can be managed, pushing back the boundaries of automatic image classification, georeferencing multibeam echosounder (MBES) processing and automatic eventing. Figure 1: Synchronized DTM, UHD still image and cross profile. Traditional methods of pipeline inspection used to include acoustic survey, performed with sidescan sonar (SSS) mounted on a towed platform such as a ROTV followed by ROV spot dives at locations of interest. Another method was ROV general visual inspection (GVI) which utilized video cameras, MBES and, commonly, pipetracker and contact CP. Today, modern methodologies such as fast general visual inspection (FGVI) and – most recently – fast digital imaging (FDI) have replaced the traditional pipeline surveys in many cases. FGVI is similar to GVI but performed at increased speeds, made possible by the latest technology (i.e. HD cameras, improved MBES and fast ROVs). FDI surveys are the latest methodology employed to inspect pipelines, using UHD cameras, laser and fast ROVs to provide photogrammetric deliverables, as well as full MBE coverage and field gradient CP – all performed at comparable speeds to historical acoustic surveys. DeepOcean performed the first FDI survey in 2017 and since then the introduction of fast ROVs has substantially increased the average speed of pipeline inspection. In 2018, FGVI was performed at an average speed of 4km/h, almost double the speed of FGVI performed with work-class ROVs (WROVs) and four times the speed of traditional GVI. The average speed of FDI survey was even higher, at an average of 5km/h in 2018. A fast ROV can transition between multiple survey methodologies with only minor adjustments to sensor configuration, making it a one-vehicle solution. This transition can be as simple as lowering the boom camera arms and reducing altitude to change between FDI mode and FGVI or, if pipetracker is a requirement, this is a simple recovery, bolt on, plug-and play-operation. With combined SSS and sub-bottom profiler (SBP) mounted, a fast ROV can seamlessly switch from pipeline inspection mode, be it FDI or FGVI, into acoustic route/grid survey mode. Fast ROVs utilize the latest in automatic station keeping to provide a platform with advanced stability for all forms of survey. A true hybrid, the fast ROV (given the right platform to operate from) can perform surveys with the speed of an autonomous underwater vehicle (AUV) but with the added functionality that having a human crew provides, such as CP contact readings or impromptu target investigations. With the current sophistication of autonomous programming, human pilots still provide the safest option for operations around sensitive subsea assets. Figure 3: Video still at 1.5m/s. Historical acoustic survey campaigns, followed by a separate campaign with ROV spot dives, were time-consuming with limited results. It was common to dive on a location and find nothing of interest due to misinterpretation of SSS data. With FDI, if an area of interest is identified online then the ROV can immediately investigate. The data provided by acoustic campaigns gave a very limited overview of the pipeline status as SSS data is very open to interpretation, whereas FDI provides unambiguous results so quick decisions can be made on mitigating actions. New survey techniques bring new challenges to the industry. With fast ROVs, data can be acquired at a rate and quantity never before experienced, but processing and reporting have yet to fully catch up. New deliverables have proven challenging to handle, process and report in a cost-efficient timeframe and, even then, operators must find a way to utilize the data in their pipeline integrity management systems in a meaningful way. New data requires new processing and reporting routines which in turn require trial and, inevitably, error – but as these latest deliverables become operators’ standard requirements, service providers and software developers are becoming ever more adept at producing them. Soon, survey processing software should be capable of producing photogrammetric deliverables at a 1:1 processing speed, whereas before service providers relied on bespoke software. Production of the new deliverables through common software will also solve the problem of standardization, something which has been a recurring issue for service providers as operators struggle to define their requirements. Whilst processing and reporting will eventually catch up with acquisition speeds and increased data size, it remains important to decide how much data is too much. For example, do operators really need LoD mesh, orthorectified mosaics or high-density 3D point cloud models for the entirety of a 200km pipeline, or is it sufficient to provide these datasets for gross defects and critical anomalies? Data accessibility is another challenge. As deliverable production improves to match acquisition speeds, the benefit will eventually be lost if the connection offshore is insufficient to transfer the data where it is needed onshore. Nevertheless, reduced processing and reporting onshore will always be welcomed by service providers and operators alike. Innovative technology brings with it new expectations. One of the first and most critical tasks the industry faced was aligning the expectations and realities of this fresh technology. Cleverly marketed sample data can cause integrity engineers’ imaginations to run wild, and whilst high-density 3D point cloud models and LoD meshes give a more detailed insight into the status of a pipeline than ever before, there are still limits to the current capabilities. However, advances in virtual and augmented reality may soon see the data’s full potential realized. Figure 4: Image-derived high-density 3D point cloud and stitched image mosaic. The development of fast ROV technology and associated sensors has provided a platform for innovation in both ROV technology and the sensors it carries. This has resulted in high-speed subsea data acquisition ROVs, and an adaptable platform for legacy sensors (MBES, SSS, HD cameras, pipetracker) and new sensors (UHD still cameras, lasers, Ultra HD video cameras). Faster acquisition leads to fewer vessels days, which leads to reduced cost. Historically, acquisition speed and processing time have been linked; a reduced acquisition time coupled with high-quality data and new types of data has created a real challenge in terms of keeping up with data deliverables demands. Further to this, the introduction and market interest in new deliverables – orthorectified mosaics, LoD mesh and high-density 3D point cloud models – means that both the contractor and client have to find new ways to work together and align the production workflow and the client front-end workflows. This problem is twofold, comprising data volume and standardization of data formats. 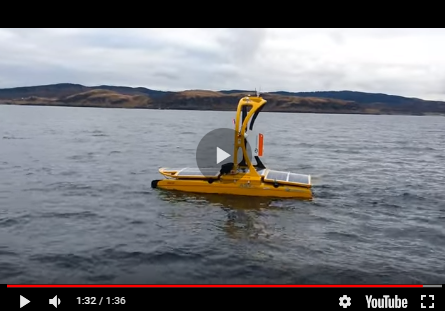 Sensor integration – as we move towards a USV and ASV offshore model, sensor integration and power efficiency will become increasingly important. Fast ROVs have helped us move forward providing an innovation platform. There is a global evolution in how all industries are handling data, the internet, the carbon footprint and AI, and these developments are creating a huge paradigm shift. This is especially relevant to the offshore industry because the cost model has been turned upside down; technology and the cost pressures are following six-month cycles rather than five-year cycles. This means we not only need to automate and standardize, but we also need to create dynamic solutions that allow for quick change. Cloud computing, AI and remote/onshoring opportunities are at the heart of these changes. Rapid technological developments are driving a new wave of innovation in the survey industry, making it unrecognizable from even a couple of years ago – but radical technology requires radical new thinking to achieve its full potential. The industry is still in a transitional period between the old and the new, with fast ROVs bridging the gap, eventually to be augmented by autonomous vehicles, automatic processing and reporting routines on the road to digitization. There will be growing pains as the industry evolves, and we all need to be willing to embrace the change.